A plant that truly lives up to its common name, Pachystachys lutea is known as the Golden Candles Plant. This is a tropical to subtropical plant from Central America. 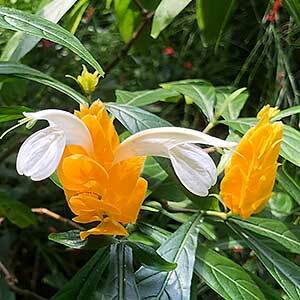 Sometimes called the golden shrimp plant, it is related to Justica species, however it is a separate species. The golden yellow flower bracts are what gives this plant its common name, they are held upright above the foliage, the flowers themselves are white and appear from the yellow bracts as they mature. This is a long flowering plant in warmer climates and can be used a background plant in the garden border, as a low informal hedge or a feature plant. Sometimes grown as an indoor plant in cooler climates, it is better outdoors as the plant forms a large bushy shrub over time. Best grown in part shade, however wityh good light for flowering. A humus rich soil and a warm sheltered position are essential. Prune back fairly hard just as spring begins to maintain a bushy habit. You can also grow Pachystachys lutea as an indoor plant, and in cooler climates this is the ideal solution. It will need very good light to flower well and will not tolerate drying out. It is easy to prune back to shape and size and makes a colourful free flowering plant for indoors or on a protected patio. Easy from cuttings taken in late spring. 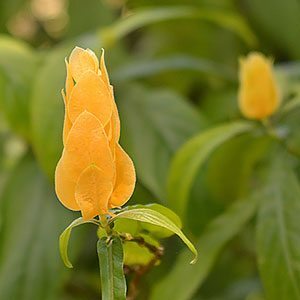 Common Names – Golden Candle plant, Golden Shrimp Plant, Lollipop plant and Golden Candles. Climate – Best suited to tropical to sub tropical. Soil Humus rich and moist with good drainage. Position – Full sun to part shade, best in morning sun and afternoon dappled shade. Flowers – Yellow flower bracts with white flowers emerging. Spread – To 2 metres. Foliage – Lance shaped, mid green. Flowers – Prominent yellow bracts with small white actual flowers.